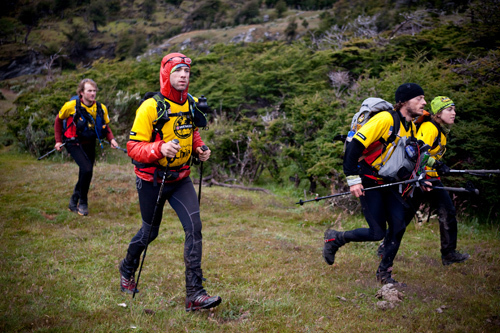 It took almost a full week of human-powered effort — six days, three hours, and 31 minutes, to be exact — to traverse the entirety of Tierra del Fuego in Chile’s Patagonia region. 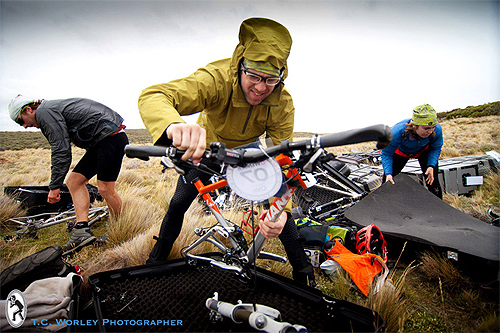 But last month, mountain bikes, trekking gear, kayaks, ropes, and a zipline over a river afforded passage on the crazy trip that was the 2010 Wenger Patagonian Expedition Race. Like all the racers that finished, the members of Team GearJunkie.com — which included myself and three companions, all racing together the entire time — traveled a total of 344 miles in the event. We carried sleeping bags, tents, survival gear, and food. Resupply drops every couple of days kept our loads hovering below 25 pounds for most of the race. But the journey to the Wenger Patagonian Expedition Race had truly started a few days before. Indeed, it took a van loaded with gear to get from my house to the airport. Then in the terminal, I juggled a cart stacked with three rolling duffel bags, a carry-on suitcase, and a daypack to wear on the airplane (and surreptitiously stuff down by my feet on the flight to Chile). And did I mention the hard-side plastic bike case with my Giant Anthem X1 inside? Delta Air Lines charged me $300 — each way! — just to get the mountain bike from Minneapolis to Tierra del Fuego. I tested most of my gear for months before heading south to Chile. But on the course, where it rained and snowed — and where wind whipped to 80 miles per hour one day — some of the gear reached its breaking point. For example, after tromping in swamps, with wet legs and feet on and off for three days straight, the Velcro on the top of my Mountain Hardware Trail Gaiters would not hold shut. It pealed back an inch or two to open the gaiter and expose my shin. Another problem came with my poles. In total, we trekked, stumbled and ran more than 140 miles over the week. My trekking poles, the Carbonlite AERGON Antishock Poles from Leki, loosened after miles on the move. Twice a basket on one of the telescoping poles snagged in deep mud and pulled a section out too far. It bent and nearly broke. But it was fixable with some careful field repair and a retightening to hold the section back solid in place. Backpacks were a crucial piece of gear. 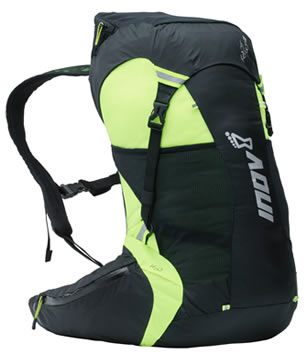 With 30 liters of capacity, I was initially concerned that my Inov-8 Race Pro 30 backpack would be too small. But the body-hugging pack proved perfect for the race. I added dual external bottle holders on the shoulder straps and an extra pouch pocket on the hip belt. This kept my race food and small essentials like lip balm and electrolyte pills accessible the entire time. Overall, the pack managed my gear and sat comfortable the whole week as my team trekked and ran on the course. At night, when we slept I emptied the Inov-8 backpack and used it as an ad hoc camp pad. There is a foam insert in the back panel, which provided some insulation from the ground. My sleeping bag, Mountain Hardware’s Ultralamina 32, was a stellar performer. It kept me warm the whole trip, even when temps plunged one night below freezing on a mountain pass. For storage in a backpack, the 31-ounce bag stuffed down to the size of a small cantaloupe.